Although the second book after Dynamics of Speed , Start Fast's logical order is first. Where Dynamics of Speed covers the intermediate and advanced dynamics necessary to truly understand how kart tires and chassis work, Start Fast focuses on helping the beginning karter make solid decisions which will guide them through their first years in karting. Interestingly enough, not only do new karters benefit from Start Fast, but due to the detail which is covered in chassis assembly, tire program basics and week to wee maintenance, even seasoned karters have reported significant improvements in speed, good finishes and fun. Start Fast will take the beginner step by step from the thought that they might want to go racing right through until they're running competitively at your local track. It covers the types of tracks, the classes, the chassis and engine, how and what to buy and much, much more. Additionally there are pictures to show the parts and how things go together as well as detailed procedures on how to do most things that you'll need to do to your chassis. 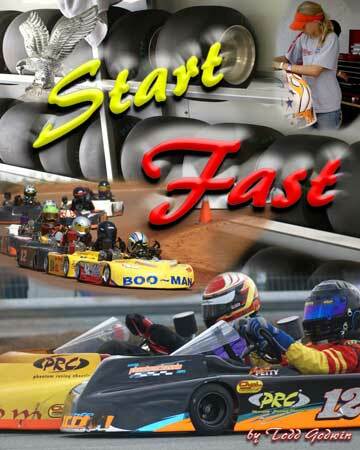 If you're thinking about getting into karting, have been in for only a few months or a year, if you struggle with what to make of all the information out there and how to use it, or if you're struggling to get competitive then Start Fast can help. The book is approximately 135 pages long and has detailed descriptions and pictures of most of the equipment that goes on your chassis, how to put it together and how to adjust it. You can look at the table of contents here. Like Dynamics of Speed, the table of contents is very detailed so that the karter can find the exact topic in which they are interested and turn straight to it. Books may also be purchased from stocking dealers found on the Where to Buy page. All books will be sent US Postal Service so please include the appropriate address.